For being an easy to use CRM software for managing one’s entire customer relationship processes, ConvergeHub also received the 2018 Great User Experience Award from FinancesOnline. “This award is granted to products that offer especially good user experience,” and with User satisfaction rating currently at 100%, ConvergeHub certainly qualified. While evaluating ConvergeHub for the 2018 Rising Star Award and 2018 Great User Experience Award, FinancesOnline’s team of experienced software analysts reviewed and compared ConvergeHub against its competitors using a set of specific evaluation criteria. 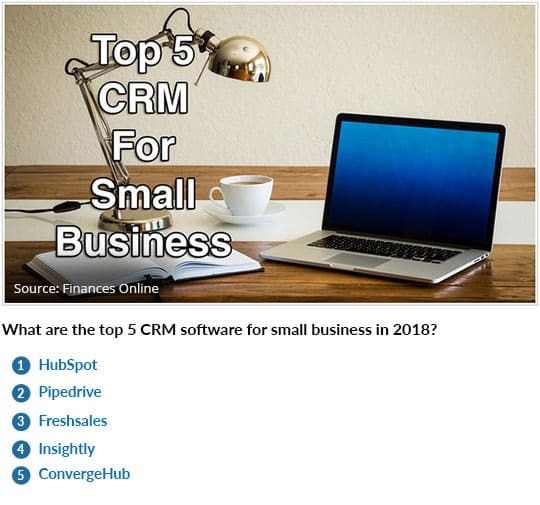 ConvergeHub was also chosen by Finances Online as one of the top 5 CRM software for small business in 2018. Single platform to manage all customer-facing business functions. Manage all sales, marketing, customer service and billing from one software. Workflow Automation that enables businesses to automate a major part of their sales, marketing and customer service tasks and save time and resources. Easily customizable application that allows businesses to customize and adapt to their own unique processes and requirements without requiring any technical wizardry. Friendly and intuitive user interface that allows quick adoption without a steep learning curve. The entire ConvergeHub team is proud of what we have built so far, and we’re humbled by FinancesOnline’s recognition of our efforts as an efficient CRM software for small business. The 2018 Rising Star and 2018 Great User Experience Awards serve as acknowledgement that we are on the right track to help our customers grow their businesses. We will continue with our efforts to serve our customers with the best software and friendly service and we can’t wait show you more awesome features we’re building!